Friends, Romans, countrymen: we have a winner! In the “Pirates of the Caribbean” trilogy, Jack Davenport played James Norrington. 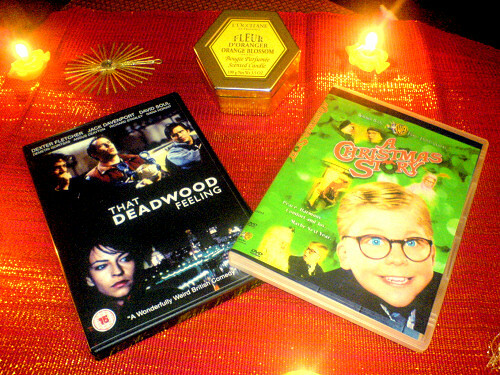 The DVDs of “That Deadwood Feeling” and “A Christmas Story” as well as a lovely scented candle from L’Occitane and delicious chocolate are on their way to Canada. Thanks a lot to everybody who participated in the contest, and also thanks for the many lovely comments about Jack and Flash Forward! Many asked if Jack would be in the next “Pirates of the Caribbean” movie. Unfortunately, I don’t know more than you, folks. Sorry! Jack Davenport’s presence would be about the only thing which might tempt me into buying a ticket for “PotC: On Stranger Tides”. And only if James Norrington was alive, shaved, washed, wearing the uniform of the Royal Navy and in the movie for more than two minutes. Nyah! An author is stranded with the characters of his unfinished Western story. You can also listen to the drama for a week after on BBC iPlayer. Woof! Sparky’s Big Yuletide Contest! Don’t know how to survive the “Flash Forward” hiatus? Already counting the days to the return of Jack Davenport? Jack Davenport, Dexter Fletcher, Demetri Goritsas, David Soul and others in a blackly comic film noir, a tale of three guys who dream of making a movie, of becoming players in the game of life. What could be simpler? Peace, harmony, comfort and joy? Maybe next year. Ralphie Parker desperately wants a Red Rider BB gun for Christmas, but his mother refuses, fearing he’ll shoot his eye out. But neither his mother, Santa Claus nor the neighbourhood bullies can destroy Ralphie’s dream… hilarious Christmas comedy, set in the 1950s and one of my favourites. Orange blossom scented candle from L’Occitane. Sparky has one in the doghouse, too! L’Occitane is a French company, known for cosmetics of best quality. They support local production and don’t test their products on animals. Woof! And because Christmas wouldn’t be Christmas without sweets, you’ll also get some chocolate! And what do you have to do to win this smashing Yuletide package? That’s all. Even a wiener dog could answer that! Deadline: 15 December, 2009, midnight GMT. Please read the following rules before you send off your mail. 1. By participating in this contest, you confirm that you have read, understood and accepted the rules. 2. You have to be at least 18 years old to participate. 3. Please be fair: only send in one mail per person. 4. No cash pay-out of your prize. 5. No correspondence will be held over the outcome of the contest. 6. If you are the winner, you’ll have to provide us with your name and address. 7. We’ll send your prize out asap, but have no influence on postal services. We hope the DVDs will be with you before Christmas, though. 8. Should, for any reason beyond our control, one of the prizes not be available, we’ll replace it with a different prize of the same value.